The world has gone online, so have I. I'm opening up a page exclusively for each and every one of my batch-mates of School of Engineering, Cusat to scribble on a few words, a few words to be cherished for the rest of my life. And of course add a few words, that would splurge our memories, even if read 20 years from now. Comment below! Moment to share : Well, there are uncountable moments, but this one I would cherish forever. The night when the TCS results were announced. All of us were immense pressure for a week or so, and it just got worse on the night of results. But it turned out to be good, people had tears in their eyes. I'll never forget Chakkara running towards me with watered eyes and hugging me tight, and all others being happy. 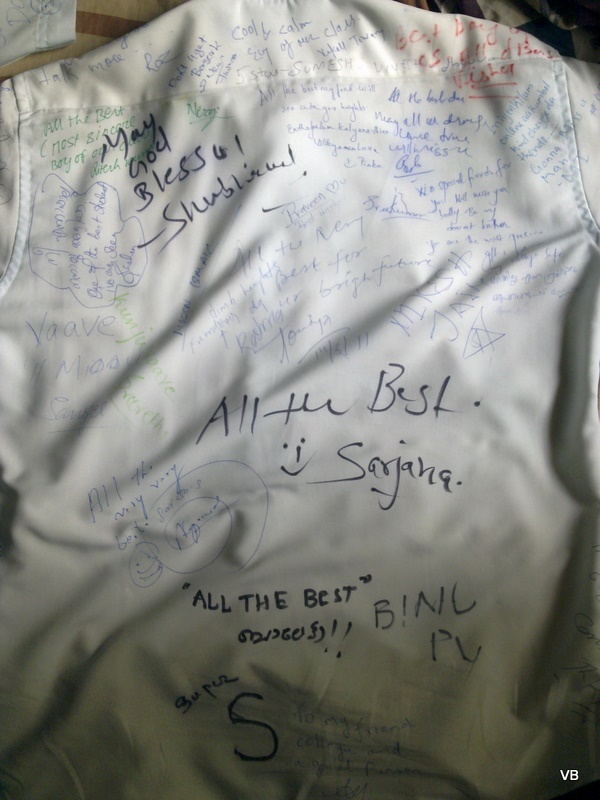 I felt proud that I had some part in the happiness, and of course the day Thasleem got into HCL too. If I go on scribbling, it'll never end, these are just the very few memorable moments. P.S - You don't need to login, just post as anonymous(from the Dropdown options), make sure you put your name though! Moment to share : MAGAZINE :D Even though I had heard of a certain Vinesh Balan , its during those magazine meetings that i finally met him. And yes [ abundantly seen is SR's facebook profile :P]. Response -- > Thanks for being Jealous :P I used to hear a lot of Nevin in our 'Group Chats', but never knew who it was. Lately I came to know you were someone who couldn be missed in a crowd :P Nice knowing you buddy! Keep up the awesome work with Berserk! Also jokes we made while having food from choice..!! Response --> Phew, you sure rigged up a lot of memories saying that Reebu! Still remember on how I got angry on you! Guess you were the lucky few to feel my anger :P Can't forget the memories with Pocket Tanks either! Rebelz rock! sweet ol memories: Vineeeeesh Balan!! de first thing dat pops up is our loooooooong walks from stop to soe..:) :) thanx a million to KSRTC bus service!! our friendship begins der...de maturrred bigg brother lyk vinesh..n de all india radio..he who has always listened to al my non stop nonsense! !with no complaints..( I must say, u r 1 of thos very very rare frnds hu hv listnd 4 a pretty long tym without telling me to shut up!) lubb u 4 dat da..:)..n yea, den he gave me so many 'first tym' experiences..de first person hu never lyked it ven i called out by his name, .. de first person hu told me dat he never had any favourites( b it fud, colour, clothes..he he!! de list goes on..).. he was neutral..!! was he ever angry?? or ws he ever too excited? OMG! de man wid so much control over his emotions..!! v ver actually 2 extremes..alleda?? ;)but being wid u ws jus awsome :)..too gud!! dont wanna miss u!! ever! Response --> Keep talking as usual Huzna :) And a piece of advice, its time to Grow up! hehe :) Every moment with you was enjoyable! Still remember seeing you for the first time at Solutions, I was like who is this(too much jaada) :P Later I came to know who she was - Like the dialogue in Jab We Met - a Unique one :P.
Moment to share : day1 orientation...still rembr meetin u as u wer d 1st person i met in cs :D...n also d kaloor to kalamasery pvt bus yathras...n rembr v celebrated d 1st strike in cusat togethr :D.. Response --> Yep, the first guy to get close with in CS. The first one to meet was Fazil though, he showed me Marine Drive for the first time :) It was on a strike day. Had a nice time together. Moment to share : I still remembered the day when for the first time i took a view of kerala thru the windows of 6310 (patna-ernakulam exp). In my school days, I have many frns from Kerala and heard a lot from them about the God's Own Country. I was thrilled that day how nature can change itself within a few kms between Coimbatore and Palakkad. Response --> LOL I can't forget the first time I noticed you, guess it was for a Magazine meet when you kept talking non-stop :P It was truly unbearable! Later came to know your potential, had great moments at the CSC GD as well as at KFC! Thanks for the Ice Cream- it was awesome! Response --> Don't have much idea when we met, but one thing clearly will stay about you - Truth or Dare! It was the moment when I realised who you were, and I admire you for that. All the best for the future! Response --> Can't the President make a speech here? I'm disappointed! Moment to share : Talkin abt moments,there are too many.. the classes the birthdays, the tours, the laughter,movies..It felt good wen dey said i got a job. Response --> Never knew you were so emotional. And lol I can't forget how we first met. I was the first one to meet you first year. When we were all fearing about ragging, one day when I was sitting alone, you came and sat near to me. We began talking and then you said you were year out and came back - bang! My heart began pounding knowing that you were a Senior! A memory to share : Really Nice Memory of getting selected along with Vinesh at Microsoft GD round, Way of conveying message and facts of yours is really nice. Response --> Had an awesome experience at the Microsoft GD, also on the fiery discussions regarding Placement Activities, hope you are happy with those now! Address : Pulavelil house , Thalayolaprambu PO, kottaym. Response --> Same here -- thep thep thep thep thep and again thep! From now on I'm not updating the Post, keep commenting! It looks better.